Large construction set with 42 beechwood pieces. Includes 6 glass marbles and a little bell. 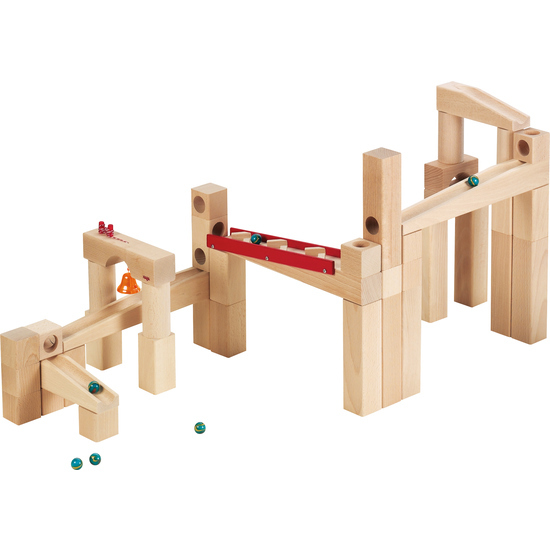 Contents: 1 zigzag track, 1 bridge with bell, 4 redirection blocks, 2 tunnel blocks, 4 ramps, 14 rectangular blocks, 8 square blocks, 2 bridging blocks, 6 Columns, 6 marbles. Includes instruction booklet free.